Luminar is an image editing program made by Skylum. It is easy to use and quite powerful and could possibly be used instead of Adobe’s Lightroom. Why consider using Luminar, because it’s much cheaper than Lightroom and Photoshop. The main drawback to switching to Luminar has been that there was no way to organize and rate your images. This is all about to change in December of 2018 when Skylum plans to add a Library tool to Luminar and it will be a free update for anyone that owns Luminar 2018. Use my Coupon Code “SNAPSHOT” to get $10 Off. That’s not all, on November 1st, there will be an update to Luminar 2018 that adds AI Sky Enhancer. This filter was created for photographers who would rather focus on creating photos, and have neither the time or inclination to spend hours correcting their images. No one wants boring skies in their photos, and restoring and improving the sky is one of the most important things while creating a masterpiece. 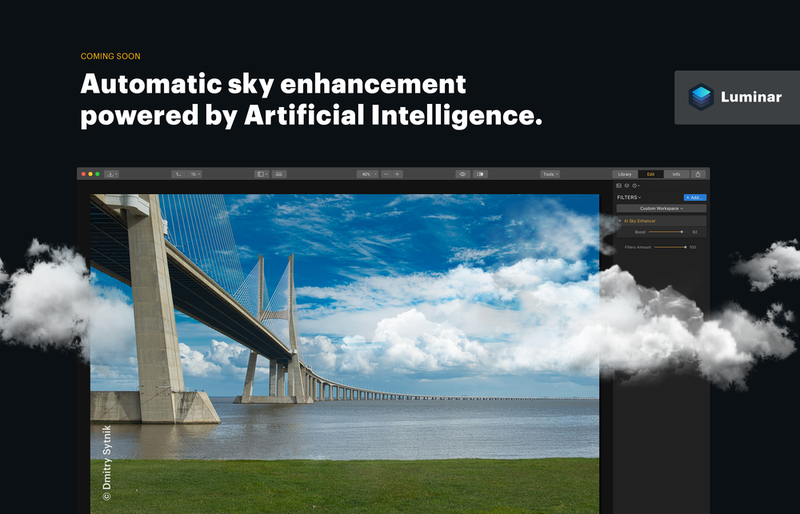 We’ve done our best to make this process as simple as it can be - the new AI Sky Enhancer creates no halos, automatically detects the edges of the sky and recognizes the sky even inside other objects such as bridges.